I’ve been uneasy about Vision Zero initiatives since the first policy was adopted in Sweden in the late ‘90s. A government policy that mandates zero traffic deaths creates a system that supports corrupt and brutal tactics in order to reach such a drastic goal. My initial concern was that Vision Zero is the perfect backdrop for mandating bicycle helmets, even though bike helmets offer little if any protection in crashes. Such laws do immeasurable damage to bicycle advocacy by creating a barrier to bicycling, blaming the victims in crashes, and making bicycling seem far more dangerous than it is. But until a few days ago, I had not associated my unease over Vision Zero with racism and enabling police brutality. Thanks to this article (pasted below) from Neighborhood Bike Works in Philadelphia, my concern over Vision Zero has more than doubled. I clicked on the Vision Zero link in the article, then the action plan for Philadelphia to find that the term “enforcement” is used 34 times in as many pages. Not a good sign. In communities where people care about each other, enforcement must be the lowest priority. Read through the article and if you have further ideas and other concerns about Vision Zero, please offer them in the comments section. And if you live in Philadelphia, be sure to take the survey linked on that Vision Zero page. Racism and its sinister effects are everywhere – the streets included. 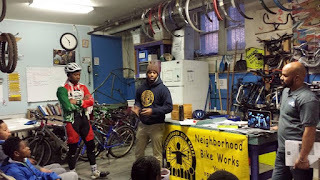 At Neighborhood Bike Works (NBW) we’ve recognized that the roadways (and elsewhere) must be for everyone and that the long history of creating streets safe only for well-off, white people shouldn’t follow us forward anymore. In the effort for safe streets and the newer attempt to eliminate all traffic deaths (an effort called Vision Zero), we must scrutinize the offered solutions to ensure that they protect the most vulnerable road users. This is a challenge with Vision Zero, however, since erratic enforcement of traffic and other laws further endanger vulnerable road users, especially people of color. As Paul Hetznecker, a Philadelphia civil rights attorney pointed out to PlanPhilly, “traffic stops have been used as pretexts for unconstitutional search and seizure.” This means that even as we work to make streets safer and to eliminate traffic deaths, we must remember that speed cameras, police presence, and other increased enforcement measures can result in targeting and surveilling people of color on city streets. At NBW, we’ve seen that police presence intimidate and harm NBW youth, program alumni, and other members of our close community. At times NBW youth graduates have been accused of stealing bikes they’ve earned at NBW. Officers have assumed that a black youth in Philadelphia couldn’t rightfully own a high quality bike. This has happened more than once, at more than one NBW site. Again and again, we’ve heard those in the NBW community share violent, terrifying stories of police brutality on city streets. One effect of this inequitable, increased enforcement is that people, including those in our NBW community, sometimes choose to stay at home, instead of joining in programs or activities. Sometimes the trip just isn’t worth the outsized risk of being pulled over or harassed on the street, seemingly at random. We’re encouraged that in Philadelphia, bike advocates have acknowledged the risks inherent in stepped up traffic enforcement in communities of color. Furthermore, red light camera bills have civil liberties protections written into them to protect against government overreach. The risks of escalated police interaction have led many local advocates to favor infrastructure improvements over enforcement. These improvements could include broadly and strategically distributed amenities such as protected bike lanes, traffic calming measures, recreation paths, crosswalk countdown timers, and street lights. Each time there is a proposed infrastructure project, we ask for people to raise the critical questions to ensure that we course correct decades of uneven, unfair infrastructure projects. You can ask questions like: Who benefits from this project? Who does it leave out? How could it be improved to make its benefits more widespread? How can this project center the wellness and prosperity of communities of color and other communities that have seen disinvestment? We don’t have “the solution”, but we know it involves a likely messy merger of the Vision Zero effort with people and groups vigilant against racial profiling, inequitable distribution of safe streets infrastructure, and police brutality. The solution to unsafe streets will involve bike advocates and also those adept at fighting gentrification, at curbing the reach of street cameras to surveil communities of color, and critically important, it will involve community input from the start. In Philadelphia, we have the opportunity to give comments on the Vision Zero Action Plan. The comment period is open for community members to weigh in on how to make the streets safer. Take a few minutes to read the plan and take the survey. How does this plan make streets safer for people of color? Could it put people of color at greater risk for police interactions of excessive force? How would you prioritize or implement these ideas? Take the opportunity to share that safe streets are streets with fair infrastructure and enforcement aimed at de-escalation.